Exhibited in London, New York and Cape Town. 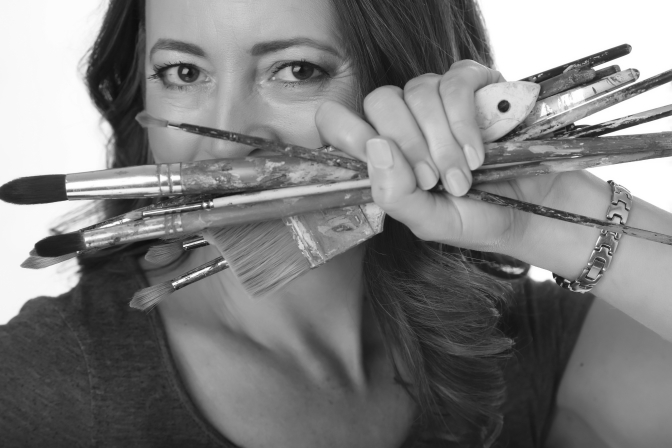 Leigh Banks graduated with a BFA degree in 1994 and continued to paint while working in art galleries and then for a London-based corporate art consultancy until 2001 when she became a full-time artist. Her career has had two parallel trajectories: one selling her artwork privately and through galleries, and the other doing corporate commissions for interiors, particularly for the cruise ship industry. She has artwork on over 20 vessels for Royal Caribbean International, Viking Cruises, Silversea, TUI and Paul Gauguin Cruises. This has demanded a level of versatility in subject and style, but her own private work has steered towards wildlife and animals, a passion that had its roots in her upbringing in Africa. "I was born and raised in Zimbabwe and my fondest childhood memories are of weekends and holidays spent with my grandparents who lived on farmland surrounded by the beauty of the African bush. I loved going for nature walks and collecting interesting tree pods, spotted guinea fowl feathers or striped porcupine quills. I would wile away time digging for ant-lions, making chongololos (giant African millipedes) curl up, watching dung beetles rolling balls of dung along or the jerking awkward walk of stick insects and chameleons going about their business. My grandmother was a keen bird-watcher and would teach me all the names: paradise flycatchers, hoopoes, sunbirds, bee-eaters, louries, hornbills, weaver birds and snake eagles to name but a few. The best treats were visits to the Zambezi Valley and Lake Kariba to game-watch or fish for bream or tiger. It was so exciting to spot elephants, giraffe, zebra, antelope, hippo and, the holy grail, big cats. I love wildlife and animals and enjoy painting them, striving to capture something of their character as well as their physical features."